Have you ever felt like someone was rude, judged, or criticized you and it just ruined your day? You may spend the rest of the day thinking to yourself, “What did I do to deserve that?”, “Did I do something wrong?”, “Why did they treat me like that?”. 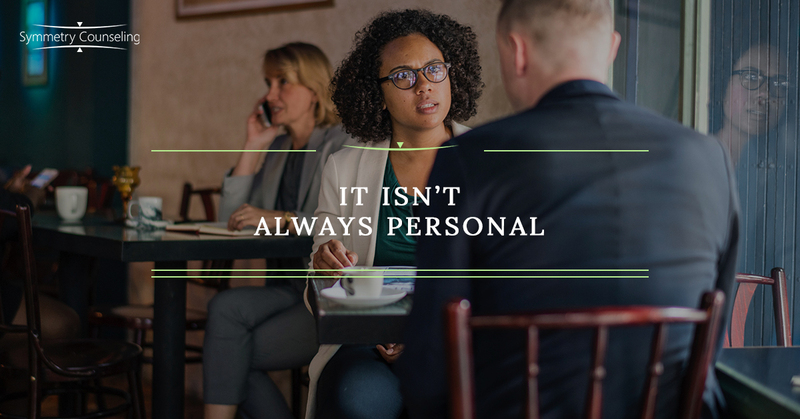 While the statement “Don’t take it personally” is said often in these situations, it is much more difficult to think about as these thoughts swirl around in your head. When you take things personally, you are interpreting what another person says or does as negative and applying it to what you believe about yourself. For example, say you believe someone judged you for being late to work that morning because they gave you a mean look as you walked in. Your interpretation could have been made because you felt insecure about being late to work or were angry at yourself for waking up too late. Most of the time, the things we take personally are never actually personal at all. Constantly interpreting things through a negative lens will eventually take a toll on your self-esteem and self-worth. Below are a few tips that you can use to stop taking things so personally and improve your self-esteem. The first step is to recognize you take things personally. Pay attention to those interactions and assumptions that put you in a bad mood or make you feel bad about yourself. Understand the weight you are putting on the opinions and actions of others as this will help you recognize part of the problem. By allowing other people to dictate how you feel, you lose some of your control. Take back control by recognizing the pattern and noting how they make you feel. You will begin to see how much you allow these small interactions to dictate your mood in such a big way. Ask yourself, “From an outsider’s perspective, did I do anything to offend this person?” If the answer is no, continue towards trying to understand the other person’s situation. For example, if you felt offended that the waiter was rude at lunch, try asking yourself why he was rude. You may think, “Maybe he was having a bad day”, “What else could this interaction mean?”, or “What is going on in his world that may be affecting him?”. Externalizing the situation with these questions takes the focus off of you. You never know what is going on in someone else’s life and their interactions are rarely meant to offend or hurt you. It isn’t always personal. You can’t please everyone, so start by trying to please yourself. Continue to work towards improving your self-worth and esteem. As you do so, you will be less likely to take the actions of others so personally. If you are constantly down on yourself, you are going to look to others to validate your insecurities. Practice getting to know yourself, accepting yourself, and forgiving yourself. As you work through insecurities and improve your self-esteem, you will notice you feel more confident and don’t take things so personally. While some of these strategies sound simple, it takes a lot of time and dedication to achieve healthy self-esteem. If you find yourself always taking things personally and would like some guidance, it may be useful to connect with a therapist. To learn more about self-esteem development therapy, contact Symmetry Counseling today!